A combined product which reduces noise emission and improves the cooling performance in one! Phobya once again introduces an innovative product. Both watercooling systems as well as air-coolers can improve the cooling and overall performance with this product: It's ''Fear it!'' for heat and noise! This shroud improves the cooing performance of your fan/radiator combination. Mounted between fan and radiator this shroud allows more even distribution of Airflow which allows a more efficient utilization of the radiator's fin surface. If mounted directly onto radiator a deadspot between the fan motor is developed which reduces the performance. Even multiple of the shrouds can be stacked with longer screws to further increase efficiency and performance. The used material ensures a better seal between fan and radiator which also helps to direct all of the Airflow through the cooling fins. 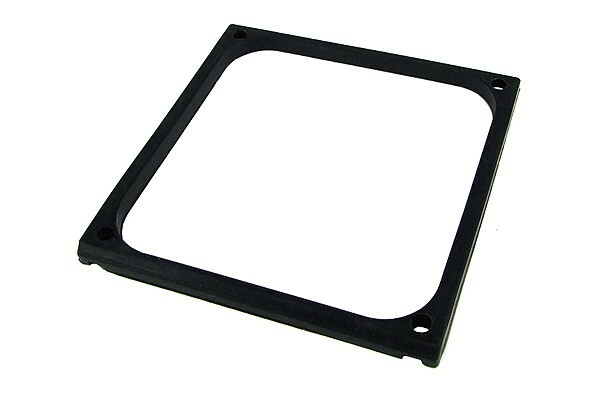 The material, hard rubber with a thickness of7mm, decouples the fan from the radiator. This mounting method is a must especially with fast fans as the emitted vibrations might otherwise cause the whole case to vibrate noisily. 3 Beoordeling (en) in andere talen. Habe mir 2 von den Shrouds Bestellt für meinen Radiator, das anbringen ist sehr einfach und es hilft wirklich. Beim Einschalten des PCs musste ich erst mal schauen, ob die Lüfter überhaupt drehen. Das die Lüfter so leise sein können wusste ich gar nicht. Einfach Top, ich kann die Shrouds nur empfehlen. Absolut nicht zu empfehlen für Radiatoren! Es ist kaum möglich den weichen Gummi richtig in Position zwischen Radiator und Lüfter zu bekommen. Beim Festziehen der Schrauben verformt sich der Shroud so stark, dass er komplett seinen Zweck verfehlt und sogar hinderlich für die Luftzufuhr ist. Hier sind die formstabilen Shrouds von Phobyia zu empfehlen.